Behind any action taken by a Nigerian, there is a malicious intention behind it; because according to Nnamdi Kanu, leader of the Indigenous People Of Biafra (IPOB), every Nigerian is a criminal -from their president, governors, senators, to the least. Once you are a Nigerian (even the world knows), you are a criminal by 'default'. Binta Nyako, the unjust judge presiding over Nnamdi Kanu's case, has shown vividly how corrupt and partial she is. She was partial to the extent of quoting the prosecution's utterances as grounds for decision. She ruled in favour of the government to ensure that her husband who is the most dangerous and corrupt governor in the history evades trial and punishment. This unjust judge, without regards to her profession, intends to intoxicate Buhari's emotions with Nnamdi Kanu's case as an escape route for her fraudulent husband, Murtala Nyako, the former governor of Adamawa State, who was accused of 40b naira fraud. The only thing necessary for evil to triumph over good is for just men to keep silent when things go wrong, especially when the power to correct the anomalies lies on them. Hence, judges that cannot administer justice are more dangerous to the society than criminals. Court was instituted to administer 'Justice' (in equity) and when that purpose is defeated, the consequence is usually chaotic. In Nigeria, justice is for sale; it is for the highest bidder. Nyako's undisguised abuse of judicial process in Nnamdi Kanu's case is another proof that Nigeria has no intention to redeem her decayed judicial arm of government. Nyako gave rulings that were all against standing court orders yet to be obeyed. This is a practice that is not obtainable in any developed nation. As Barrister Ifeanyi Ejiofor argued on 12 August 2016 at a press conference, "no one individual can commit treason according to the Nigeria constitution"; as against the 'ever dynamic' charges leveled against Nnamdi Kanu. Hence, it is evident that Nyako is not considering the constitution/the rule of law rather, the rule of her paymaster. Journalists have been abused at court, supporters of Nnamdi Kanu have been tortured, freedom of press is endangered -all these were not done at the creeks or secret places, they were done right inside the Nigerian Federal High Court. Yet, it has not received any condemnation from judges and the government. From Nyako's body language, it is clear she is the prosecution counsel. Undoubtedly, she is determined to keep Nnamdi Kanu incarcerated. Nyako has continued from where Injustice Tsoho stopped and is likely to end disgracefully like he did. Nnamdi Kanu case, which has proven to be the toughest test of the Nigerian judiciary, has proven that justice is alien to Nigeria and Nigerians. Nyako forgot that we are Biafrans, we never say "die". Injustice over Nnamdi Kanu's case can only spur us the more. His incarceration has brought so many to the agitation, the killings have proved IPOB right, Amnesty's report has dragged Nigeria to the mud. 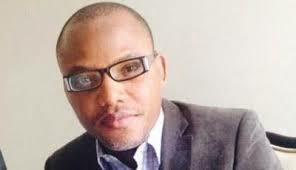 "At the end, Biafra will come" - Nnamdi Kanu.